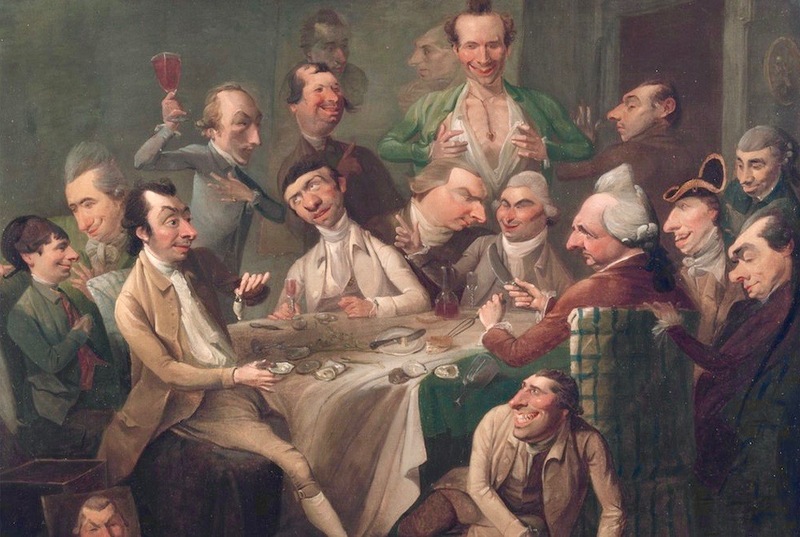 A Caricature Group by John Hamilton Mortimer. Courtesy of the Yale Center for British Art, via Wikimedia Commons. Of course, if you ask most people, they are likely to say they deplore gossip, but as a social scientist who studies how organizations work, it’s clear to me that it plays a more positive role in the workplace than we might expect. Research suggests that gossip provides groups with important benefits. For example, recent social psychological studies consistently have found that gossip can be motivated by the desire to protect one’s group against those who violate norms. People begin gossiping when they observe someone behaving in ways that are not in line with group mores. A norm violator who, say, doesn’t contribute to group goals while benefitting from group resources is engaging in behavior that economists call “free riding.” Observing a group member behaving like a free rider motivates people to gossip about the norm violator, in an attempt to protect other group members as well as the group’s resources as a whole. Studies also show that gossiping is an effective way to deter group members from behaving selfishly. The mere threat that other group members might gossip about uncooperative actions makes members more cooperative. For example, in 2011, I worked with Gerben Van Kleef on an experiment that asked participants to choose between keeping valuable lottery tickets for themselves or donating them to the group they belonged to. If a ticket that was donated to the group won, the whole group would share the prize. We found that participants gave more lottery tickets to the group when they believed that their group members would learn about their decision and when they believed group members had a high tendency to gossip. This finding was driven by reputational concern; when the threat of gossip is high, group members worry that their reputation may be damaged when they behave uncooperatively. The likelihood that others might gossip about them motivates people to behave according to group norms. From this angle, gossip seems remarkably effective at deterring group members from engaging in selfish behaviors in the first place, and punishing them when they do. Of course, one could argue that directly informing norm violators that their behavior is unacceptable would also serve the goal of sanctioning or preventing norm violations. But most people don’t like direct confrontation, and research from the 1970s suggests that people refrain from overt sanctions because of the risk of retaliation. Indeed, gossiping about norm violators is obviously much less risky, as it enables people to indirectly punish norm violators, build coalitions, and warn their group members against uncooperative slackers—all without exposing themselves to possible adverse reactions by the norm violator. Recent research backs up this strategy, finding that gossip is at least as, or even more, effective in establishing cooperation than directly punishing norm violators. As I and other colleagues have done research that essentially sings the praises of gossip, enthusiastically discussing its benefits for group functioning, I’ve come to wonder why the idea that gossip is bad is so widespread. Many people claim to hate gossip. Religions around the world view it as asocial, objectionable behavior (the Quran, for instance, compares gossiping to eating the flesh of one’s dead brother). How can we understand the virtually universal condemnation of gossip in light of the functions that gossip has for groups? Gossip can be used to punish group members without requiring that the punishers have any confrontations with potential negative consequences. And it becomes an even better stealth weapon if one consistently portrays oneself as a non-gossiper. Currently there is no research that directly answers this question, so we can only speculate on why everyone claims to hate gossip so much. Possibly people gossip for many reasons, of which the positive ones, like warning groups about norm violators and protecting group cooperation, are the most benign. In fact, there are several lines of research that point to other motives for gossip. Gossip has, for example, been described as a form of indirect aggression, driven by self-interested motivation to destroy the reputation of potential social rivals. Moreover, gossip may also have negative effects on groups. It has been shown to coincide with specific types of social network structures called coalition networks, in which some individuals have positive connections with each other but jointly share negative ties with someone else. Coalition networks are plagued by destructive power struggles. Despite the alleged benefits of gossip to groups, studies in organizations also have found correlations with decreased cooperation and decreased psychological safety—the feeling that the social environment is safe for interpersonal risk-taking. These lines of research paint a much less rosy picture of gossip: Rather than a group-oriented mechanism that fosters social control and cooperation, they portray gossip as a self-interested behavior that is toxic for groups. There is currently no overarching theory or empirical study that can pinpoint exactly what motivates gossip, and when it is useful or, in contrast, detrimental, to group functioning. However, if we accept the idea that gossip is a multifaceted phenomenon that is sometimes driven by genuine concern for the welfare of one’s social groups, but at other times driven by less noble motives, we may begin to speculate about where gossip gets its negative reputation from. For starters, there is what psychologists call negativity bias, which means that negative impressions are stronger than positive ones. When people experience a combination of negative and positive things, they evaluate them more negatively than you’d predict. One single instance of nasty, mean gossip might spoil a whole barrel of group-protective, pro-social gossip episodes. But that still leaves another question: Why do people claim to hate gossip but still participate in it? For that, we could look at another famous bias, the self-serving bias, which is the tendency to perceive oneself in an overly favorable manner. Because of this bias, we may see gossiping in general as objectionable, but our own gossip as acceptable. Finally, it’s possible that simply saying we hate gossip makes gossip itself even more effective. Studies that have examined gossip as a mechanism that protects groups against norm violations consistently point out that gossip might be such a popular response because it is relatively risk-free. Gossip can be used to punish group members without requiring that the punishers have any confrontations with potential negative consequences. It’s an effective strategy, in other words, but there’s an element of sneakiness about it. And it becomes an even better stealth weapon if one consistently portrays oneself as a non-gossiper. Claiming to hate gossip while at the same time using gossip when the need arises makes it very unlikely that norm violators will recognize who is attacking them. Perhaps this contributes to the popularity of gossip and its simultaneous universal condemnation. Many things about gossip are poorly understood. But if someone tells you they hate gossip, you might want to question what exactly their intentions are. Bianca Beersma is a professor of social science at the Free University Amsterdam.